I realized today I never posted this really awesome review we received from Kirkus (months ago. doh!). They're one of the big ones, and we were really excited to have such a positive review. They've liked both books in The 13th Reality so far, which is a huge relief! Tick, Paul and Sophia were brought together to solve a set of clues that led them into other dimensions in The Journal of Curious Letters (2008), the first installment in this intriguing series. They've spent the summer relaxing with building anticipation for their next call to action. It isn't long in coming. A message from Master George tells them to meet in the woods for transportation to headquarters and their next assignment. They're whisked away into another reality…but was it Master George who did the whisking? I have to say, it really shocked me how saddened I was by the passing of Mr. Jackson yesterday. Honestly, I haven't even thought of him or his music for years unless a song randomly showed up on the radio. But watching the news coverage brought back a storm of memories and nostalgia. I'm a child of the eighties. To my younger readers, that probably makes me sound as old as their Great Grandpa Whitaker runnin' around in his long johns scratchin' himself. But it wasn't THAT long ago if ya think about it. Anyway, Michael Jackson is my generation's Elvis Presley. (Kids, go google that name. He lived before Zac Efron but after Abraham Lincoln.) Jackson is an icon. His music defined my childhood in many ways. He changed the industry. And to this day I love every single song on the Thriller album. Do you realize that thing sold 48 MILLION copies? Do you have any idea how staggering that is? In today's world, if an artist sells ONE million they are considered a big success, and if they sell ten million they are an absolute super star. Twenty million would put you in the stratosphere. Mr. Jackson sold 48 million. Of one album. Wow. Well, I just wanted to pay a small tribute to him. I loved his music as a kid, and I've loved hearing so much of it the last couple of days as everyone is talking about him and paying respects. 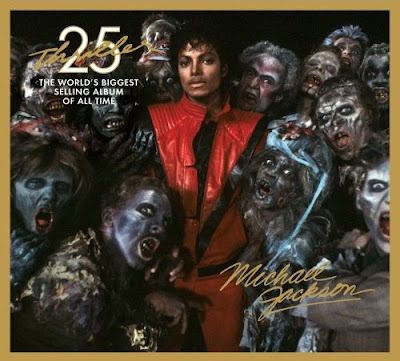 Also, the music video world changed forever with THRILLER. Watching that thing was an event for us, let me tell you. 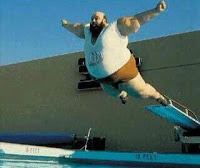 And, ya know, we can all learn a valuable lesson from his later life. None of us will ever know if he did some of the things he was accused of. Maybe he deserves the benefit of the doubt. And yes, he was very eccentric. But the world branded him as a freak and made fun of him. Brutally and cruelly. Imagine if he'd been your son, or your brother, or your father. Shame on you, world. Shame on me. The world also lost Farrah Fawcett yesterday (another major eighties icon). My wife taught me another valuable lesson. I said something about how unfair it was that Fawcett didn't get any real media tribute because it was the same day as Michael Jackson. My wife responded, "Well, most of us don't." Well, since it's officially summer, and I'm officially sweating, I thought I'd post a Top Ten list I did last year. Most of you are new to the Dashner Dude since then, so I hope you enjoy. And hey, Amy left a golden opportunity for someone in the comments on my previous post. 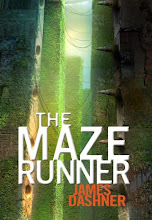 She's finished her advance copy of THE MAZE RUNNER and is willing to mail it to the first person who contacts her. Thanks Amy, and may the fastest person win! 1. The initial feedback on THE SCORCH TRIALS is really encouraging. By initital feedback I mean my wife Lynette and good friend J. Scott Savage. Both of them love it, and Scott even went so far as to say it's better than the first one. And he doesn't lie to me. Sometimes I wish he would. He can be a real jerk. And he smells funny, too. But I like him. 2. As of right now the release tour for THE MAZE RUNNER is scheduled to run from October 6th to October 24th and cover 8 to 10 cities. Do you realize that's only three and a half months away? Seriously! I can't wait. 3. I need to shift gears soon to completing THE BLADE OF SHATTERED HOPE (Book 3 of THE 13TH REALITY). Right now it's about halfway done, but I had to put it aside when we sold the sequels to MAZE a few months ago and received a tighter deadline. I've been reading back through what I'd written and it's complete and utter crap. Okay, just kidding. I like it a lot. But I have a lot of work to do, and it's due September 1st. 4. One thing I did remember is how much I love Tick Higginbottom. And I almost feel bad for the really, really awful thing I put him through on page 37 of the manuscript. Poor kid. He's going to need serious psychological help when this series is done. 5. I really want to give a shout out to my very good friend (and editor for 13TH) Lisa Mangum, who went and did something crazy and wrote her OWN book. Can you believe that? It's like Stephen Spielberg suddenly deciding he wants to be the star of one of his movies (kind of - work with me here). Well, Lisa did it, and she did an AWESOME job. It's a young adult paranormal romance trippy time travel freaky twisty creepy adventurous book. It's called THE HOURGLASS DOOR and has a really awesome cover with even better stuff in between. CLICK HERE to find out more. 6. The cover artist for MAZE, Philip Straub, also has a book out, called UTHERWORLDS. This guy's art is simply AMAZING and takes me to other worlds like no other. And he nailed my vision of MAZE. To learn more about his book, CLICK HERE. 7. Why do restaurants with take-out services have special parking spaces for people picking up? This seems grossly unfair and fakes me out every time. I mean, think about it. People who are dining "in" walk to the restaurant and, when they're done, walk back out. People who get take-out ALSO walk to and from the restaurant. Same physical effort. Same purpose. Same amount of money. No! Wait. They spend LESS because they don't tip. This is an outrage. Someone write their senator immediately. 8. We sold our house in 2 days. Very close to getting the one we offered on. Very happy and excited. It's only a few miles from the current pad (that's what the cool kids call it), but it's bigger which is good because my kids were about to murder each other. They've been living in glorified closets and have nowhere to play. Which is why I, also, was about to murder them. By the way, we met our potential neighbors, and their son's eyes lit up when he found out who I am. He's a big fan! Can you believe that? It was very surreal for me. 10. Please tell me you've seen the movie UP. Please tell me you have. If you haven't, I order you to drop what you're doing and leave your house. Immediately. I firmly believe this is the best PIXAR movie so far. Definitely. Not the funniest. But the best. How they made a children's movie with so much depth and meaning is just amazing. See it. Now. I had a great time at the BYU writer's conference. Hanging out with so many writers and book biz people is always good times. I felt like my workshop on Friday afternoon went well except for one thing that I want to clarify, and maybe it's something we can all learn from. One of the questions at the end of my workshop went as follows: Did your books with the smaller publishers help you get the book deal with Random House? In hindsight, I gave a stupid answer. I said that those books neither helped nor hurt, that they were irrelevant. I can tell by your gasp that you took my response the same as many others. It sounds ungrateful, arrogant, and discouraging to those who have books with small pubs. Well, this is what I meant: No pub is going to buy your book just because you already have a book. They will always make their ultimate decision based on the merits of the book they are considering for publication. The only exception would be mega mega superstars. If Stephenie Meyer proposed a book about foot fungus and how it affects primate odor sensory functions, it'd probably go to auction, just based on her name. But most authors would have to show they have a book that can sell based on the book itself. What I did NOT mean was that my Jimmy Fincher books and THE 13TH REALITY didn't help me get to where I am with RH. They helped me in countless ways. Gave me a resume to get my foot in the door, showed I know how to work to promote, proved I can maintain a fan base, pushed me to attend conferences and workshops, created a path for me to meet many, many authors and agents and publishers. Led to a lot of networking. Led to my becoming good friends with Sara Zarr. Which led to my getting Michael as an agent. Which led to my book deal. So, in hindsight, my answer should have been a resounding YES. They did help. Tremendously. However, in the end, I know for a fact that neither Michael nor Krista would've bought MAZE unless they believed in its potential, regardless of what I'd done before. Why am I harping on about this? Because a good friend of mine who has a book coming out with my original publisher took my answer the wrong way and was very discouraged. However, and very luckily for me, she had the guts to approach Krista and me afterward and we had a really great discussion. I think things were well clarified and I know she's on the right path. We can all learn a lot from... I'm not sure she'd want me to mention her name. Let's call her FISA (Future International Superstar Author). FISA is doing everything right. Writing like mad, attending workshops, taking opportunities when they present themselves, doing school visits and book signings, networking, networking, networking. The irony here is she's pounding the pavement like I've always preached, and yet I almost gave her the wrong message that she was wasting her time. For that, FISA, I'm sorry. And I'm so proud of you. You ARE on the right path, and it leads to greatness. I have no doubt whatsoever. Hey there everybody! I'm still alive and kickin' in case you were wondering if I'd been hit by a water buffalo or smashed in a meat grinder. Nope, still here. I'm at the BYU Writing and Illustrators for Young Readers conference this whole week. It's a pretty well known shindig, and my editor, Krista Marino, is one of the main guests. So I'm here doing various things like driving people around, mingling, eating good food, etc. I also get to introduce Krista at her main speech today, and I teach a workshop tomorrow afternoon. I had a very interesting encounter with another author on Monday that humbled me greatly. Maybe I needed it after MAZE got so much attention at BEA and on my prepub tour. :-) It wouldn't be appropriate for me to give details or names, but let's just say my poor wittle feewings were hurt. But don't worry. It's all good now. Last Saturday's first annual Utah teen writer's conference was a mind-blowing success. Much kudos to Josi Kilpack and her committee for a wonderful event. We had over 110 teenagers attend. Over 110! Trust me - that is an amazing turnout, and I'm really proud of all of them for taking their craft and their dreams so seriously. As for this week, I've been very fortunate to spend a lot of time with some amazing people from New York. Krista, of course, but also Edward Necarsulmer, an agent from McIntosh and Otis, Martha Mihalick from Greenwillow Books, and Margaret Miller from Bloomsbury. They are so cool and fun and knowledgeable! My favorite thing this week has been just listening in on them talking the biz. Awesome. I've also been able to hang out with many of my author friends (way too many to name!) and attendees of the conference I've gotten to know over the years. It's been truly great. And now, for my exciting announcement: right on the tail of selling Russian rights, we've now also sold French rights to THE MAZE RUNNER. The publisher is Pocket Jeunesse, and they do a lot of big Young Adult titles in French. So we now have two foreign rights sales, and both of them bought the entire trilogy, which is very cool. Kudos to Lauren Abramo at my agency for her terrific work!!! According to Google, here's the translation: Le Labyrinthe Coureur. Any French speakers out there? Does that sound right? Hope everyone is well and happy and currently not in jail. Cheers! Yesterday was the poor little orphan child prepub date, two weeks after the rest of them. But last was certainly not least! I had an awesome time. I got to hang out with Dandy Conway again, the Random House Sales rep who I met in San Francisco. I spent the afternoon with almost twenty teenagers at The King's English bookstore. 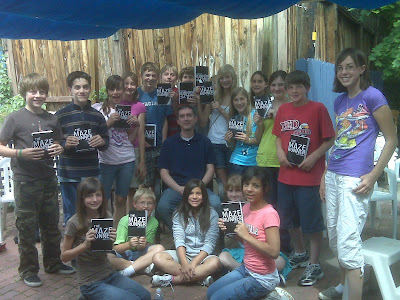 These kids were way too smart, and grilled me ruthlessly until I gave away things about the series I never should have. I can only hope they eat lots of sugar and get hit in the head a couple of times so they'll forget. That night we had dinner at the Bambara restaurant with Dandy and representatives from the Salt Lake City Library, TKE, South Jordan Middle School, Sam Weller's Bookstore, BYU, Deseret Book, and Barnes and Noble (remember the Ode to Angie?). And this time my wife got to come! I was really glad she got to see what it's like, since a prepub tour is kind of a once-in-a-lifetime thing. We all had a great time and talked each other's ears off for three hours. Oh, and it sure seemed like everyone liked the book! In other news, here are a couple of new mentions in Publisher's Weekly (CLICK HERE) and School Library Journal (CLICK HERE). I knew about this last week, but I wanted to wait until the BEA hubbub was over to announce it to you guys. This is my first ever foreign rights sale! And somehow it seems extra cool that it went to Russia. Why? I don't know. I mean, come on. It's Russia. That's just cool. According to rustran.com, that's how you say "The Maze Runner" in Russian. Any experts out there wanna verify that? Of course, I can't even read it, much less say it. But I can just imagine Ivan Drago from ROCKY IV yelling it at me with spit flying out of his mouth and sweat off his face right before he pummels me with his inhuman gargantuan steroid-jacked fist. Of course, after he read the book, we'd become fast friends and implement world peace just like he and Rocky did. Only four months till release date!!! UPDATE: I also wanted to say thanks to Lauren Abramo, the international rights agent at Dystel & Goderich, for making the Russian sale happen. Way to go!!! Okay, I've been putting this off because it seems so daunting to sum up such a flurry of events as I experienced over the last several days. But I want to and have to, so here we go. First off, let me just say this: everything was awesome. Incredibly awesome. And to avoid using the word awesome forty million times, please just assume that everything I tell you about was indeed awesome. Are we good on that? Good. 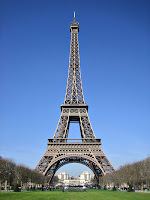 Let's go back to where I last left you, after my incredible visit to the Random House offices and dinner last Tuesday. Met my publicists Noreen and Emily at this cool dude named Mitchell's quaint house in the East Village to film video bits for online promotions with all the major retailers. Ya know, the whole mock interview thing. We also took a bunch of author photos. I'm almost certain I was an idiot and I can only hope Mitchell does some ingenious editing. Emily then took me to brunch at this sweet place called Norma's. They had a menu item for $1,000 dollars that dared you to expense it. I thought that was quite hilarious. Had a great time getting to know Emily and asking her a gazillion questions. Good times and good food. Spent the rest of the day relaxing, working, and gearing up for BEA. In the evening, I met my friend Brandon Mull (FABLEHAVEN), his wife Mary, and Jennifer Schoebinger for dinner at a little jazz restaurant called The Garage. Good times and good food. 8:00 - BEA kicks off with the annual children's breakfast. Julie Andrews (yes, that Julie Andrews) hosted, Peter Yarrow (yes, that Peter from Peter Paul and Mary) sang a few songs, and a few authors spoke. Most memorable was Meg Cabot, who is freaking hilarious. 11:00 - My signing of THE MAZE RUNNER at the Random House booth, Noreen helping me. I have no idea how many books I signed, but we went steady and fast for the entire hour and had to do some on the side afterward. Right after, I got to meet Libba Bray!!!!! 12:15 - Had lunch with my agent Michael, my editor Krista, and Lauren Abramo (foreign rights agent for Dystel & Goderich, my agency). Good times and crappy food (slim pickins at the Javits Center). 2:00 - BEA Young Adult Buzz Forum. Krista did an AMAZING job presenting her thoughts on MAZE to the audience. The room was large and packed, standing room only. Word on the street is that we had way more people show up than they did for the adult buzz forum. boo yah. If you missed it in my last post, the best way to recap this event is for you to read the article in Publisher's Weekly: CLICK HERE. 3:30 - Meeting with RH folks and a representative from Levy's, the group that distributes books to places like grocery stores, Target, KMart, Walmart, etc. Her name was Laura, and she loves my book! What a great person to have on my side. She kept apologizing for gushing, and I kept asking her to please gush some more. Something was said about me signing 2,000 books for her company when I'm in Chicago this fall for the release tour. Yeah, that'd be pretty awesome. 5:00 - Noreen, Krista, Emily, and I head over to Brooklyn for the ABC (not quite a) Dinner and Silent Auction. That's not my description - that's what it was actually called. It consisted of a cocktail party, a program, then an auction of tons of original illustrations from children's books. Katherine Paterson (BRIDGE TO TERABITHIA) was one of the speakers. My friend Shannon Hale hosted, and she was incredible. In fact, instead of rehashing everything, I'm going to link you over to her blog where she gave a great recap: CLICK HERE. One really cool thing about this event: one of the three featured drinks at the bar was called "The Maze Runner." I really want to slap myself silly for not getting a picture of the sign for it!!! The other cool thing was that I totally got to hang with lots of RH people and other authors. Afterward I went back to the hotel and went to bed, utterly drained and exhausted. And happy. Lord have mercy this is a boring post. Too much info and too little time! 10:00 am - Signing of THE 13TH REALITY at the Shadow Mountain booth. We had 200 books, and signed all of them. Went really, really well. 11:30 - Lunch with Michael and my very good friend, Sara Zarr (SWEETHEARTS, STORY OF A GIRL, upcoming ONCE WAS LOST). Good times and not-so-crappy food. 2:00 - Author panel from the YA Buzz Forum. This is where the six authors from yesterday's forum got a chance to speak out. David hosted once again. It was short and sweet, with each of us reading the opening passage from the book then answering a few questions. Not sure where I rated on the idiot scale, but I think it went okay. I did try to make a couple of jokes, and I'm pretty sure no one laughed. 3:00 - Michael and I finally got to walk the showroom floor, visiting all the publisher booths. Way fun. 5:30 - The Simon & Schuster cocktail party for Simon Pulse and Aladdin authors. I was there for four hours and it was way awesome. (oopsie daisy, there I went and used that word again.) I had so much fun and felt so much love. Wonderful editors, marketers, publishers, and authors. Thanks for making me feel so welcome and part of the family! Good times and good food. OK, this is where new people to The Dashner Dude might get confused. MAZE is being published by Random House under the Delacorte imprint. 13TH REALITY is published by Shadow Mountain in hardcover, S&S (Aladdin) in paperback (1st one coming this Christmas). So I'm currently working with three different publishers. If I'm totally honest, this is proving to be hard for me. I have this neurotic worry that someone will think I'm cheating on them or don't love them as much as someone else. Or that someone will dump me because I won't commit my whole publishing life to them. I've been assured by my agent and every other person involved that to worry about such a thing is complete nonsense. Do you think I'll stop? Of course not! Because I'm insane. Whew. Luckily this post is like forty thousand words by now, so no one probably read this far anyway! See how smart and clever I am? Quite brilliant, really. Okay, almost over. Didn't do much Sunday morning because my brain had imploded from glee. But the flight home was the fastest five hours of my life. Why? I sat between my very good friends Brandon Mull and Brandon Sanderson (after some very clever seat maneuvering), both of whom just signed seven figure deals, and we talked our biz the entire time. I loved every single minute of it. WOW. BEA. What a thing it was. But after all that, you know what I can honestly say was THE highlight? Getting to know Michael and Krista in person and hanging out with them. Seriously. To have such amazingly promising professional relationships, and yet feel like we've been friends for a thousand years? THAT's what I call priceless.